Figure 2-32. Navigation reference system (NRS) waypoints. Jet routes are depicted in black with a “J” identifier followed by the route number (e.g., “J12”) and are based on VOR or VORTAC NAVAIDs. 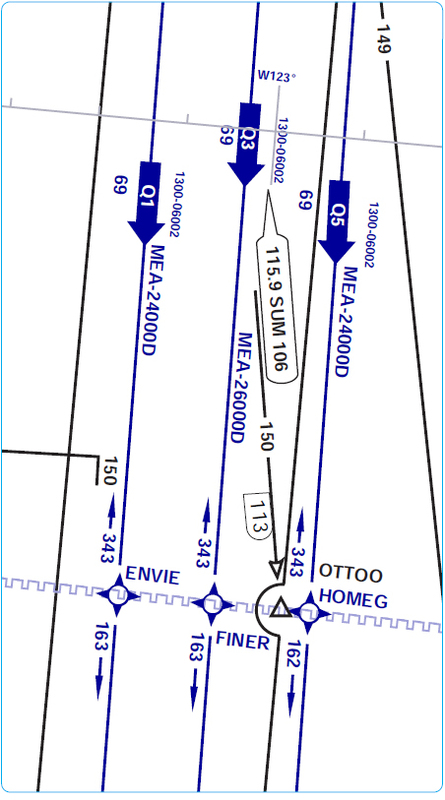 [Figure 2-33] RNAV “Q” Route MEAs are shown when other than 18,000 feet. [Figure 2-34] MEAs for GNSS RNAV aircraft are identified with a “G” suffix. MEAs for DME/DME/IRU RNAV aircraft do not have a “G” suffix. 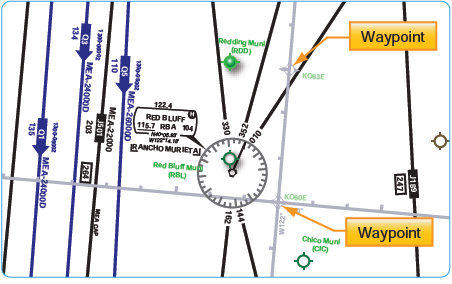 All RNAV routes and associated data is charted in aeronautical blue and magnetic reference bearings are shown originating from a waypoint, fix/reporting point, or NAVAID. When joint Jet/RNAV routes are depicted, the route identification boxes are located adjacent to each other with the route charted in black. [Figure 2-35] With the exception of “Q” routes in the Gulf of Mexico, GNSS or DME/DME/IRU RNAV equipment is required along with radar monitoring capabilities. For aircraft that have DME/DME/IRU RNAV equipment, refer to the CS for specific DME information. Figure 2-34. MEAs on RNAV (Q) routes. Figure 2-35. Joint jet/RNAV routes. Victor airways are a system of established routes that run along specified VOR radials, from one VOR station to another. The purpose is to make flight planning easier and they help ATC to organize and regulate the air traffic flow. Almost all commercial flights are routed along these airways but they are available for use by any pilot provided that the proper altitudes are employed. The procedure for getting established on a victor airway is to either fly directly to a nearby VOR or to intercept an airway radial along the route of flight. Once the pilot is established on an airway, it is important to follow the procedures and guidelines put in place to ensure air traffic separation and optimal safety on the airway. When using victor airways for navigation, procedures do not allow the pilot to jump from one VOR to another, but must navigate from one to the next by using the alternating outbound/ inbound procedure of linking VORs. For example, when departing from Zanesville VOR on V-214, the pilot selects the 090° radial with a FROM indication on the course deviation indicator (CDI) and should correct as necessary to continuously maintain track on the centerline of the airway. [Figure 2-36] The pilot should continue on this course until it is time to change over to the inbound course to the Bellaire VOR. 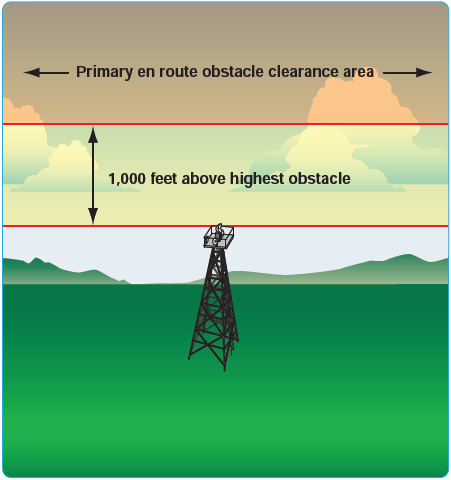 All published routes in the NAS are based on specific obstacle clearance criteria. An understanding of en route obstacle clearance areas helps with SA and may help avoid controlled flight into terrain (CFIT). 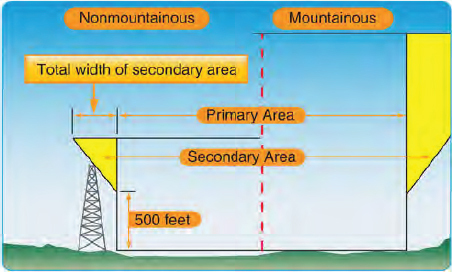 Obstacle clearance areas for the en route phase of flight are identified as primary, secondary, and turning areas. The primary and secondary area obstacle clearance criteria, airway and route widths, and the ATC separation procedures for en route segments are a function of safety and practicality in flight procedures. These flight procedures are dependent upon the pilot, the aircraft, and the navigation system being used, resulting in a total VOR system accuracy factor along with an associated probability factor. The pilot/aircraft information component of these criteria includes pilot ability to track the radial and the flight track resulting from turns at various speeds and altitudes under different wind conditions. The navigation system information includes navigation facility radial alignment displacement, transmitter monitor tolerance, and receiver accuracy. All of these factors were considered during development of en route criteria. From this analysis, the computations resulted in a total system accuracy of ±4.5° 95 percent of the time and ±6.7° 99 percent of the time. The 4.5° value became the basis for primary area obstacle clearance criteria, airway and route widths, and the ATC separation procedures. The 6.7° value provides secondary obstacle clearance area dimensions. Figure 2-39. Non-mountainous obstacle clearance in the primary area. Figure 2-41. Primary and secondary obstacle clearance area.